A 17-year-old male patient presented with hyperpigmented, thick, and hard lesion over right foot since 6 years. Initially, the lesion was small, hyperpigmented papule, which gradually increased over period of years, became linear plaque with hard and warty surface. Patient gave a history of similar lesion 10 years back for which excision was done. There were no other systemic symptoms and also no history of trauma and external bleeding from any other site. There was no history of tuberculosis in patient and any other family member. On examination, a single linear plaque of about size 10 cm × 5 cm was present over dorsal aspect of right foot. 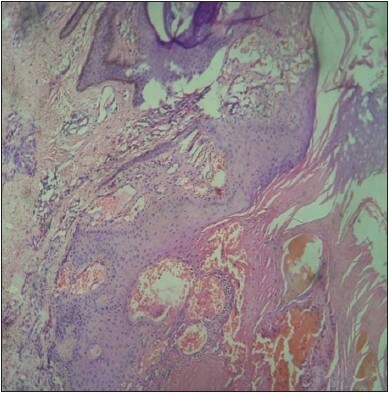 The lesion was thick, hyperpigmented, hyperkeratotic and warty with hard consistency [Figure 1]. There was tenderness on palpation. There were no bleeding points. With these findings a differential diagnosis of cutaneous tuberculosis, deep fungal infection, viral warts were made. Routine blood investigations were within the normal limits. Chest X-ray was within the normal limits and Mantoux test was negative. A skin punch biopsy was taken and sent for histopathological examination in pathology department. It interestingly showed features of hyperkeratosis, acanthosis and elongation of rete ridges, dilated and congested blood vessels in papillary dermis. This suggested the diagnosis of angiokeratoma circumscriptum (AC) [Figure 2]. The diagnosis was revised and literature was scanned. Angiokeratoma circumscriptum is characterized by hyperkeratotic verrucous vascular linear plaque which may either be congenital or acquired. The commonly involved sites are leg, foot, thigh and buttock in linear or zosteriform pattern. AC may be associated with the Klippel-Trenaunay- Weber syndrome More Details, Cobb's syndrome and other mixed vascular malformations. Our patient did not show any sign and symptom of these associated syndrome. The pathogenesis of angiokeratomas is still unknown. The primary event is vascular ectasia within the papillary dermis. Epidermal changes seem to be a secondary reaction. It has been speculated that the reactive epidermal growth is due to increased cell proliferation on the surface of vascular malformation and also due to close location of vascular spaces within epidermis. AC has been reported to develop overlying an arteriovenous fistula and in areas of lymphangioma circumscriptum after local injuries. Angiokeratomas may be treated with complete surgical excision, cryotherapy and laser ablation by argon lasers. Our patient was not ready for surgical excision. The patient was treated with cryotherapy for four sessions 3 weeks apart. Liquid nitrogen spray was used for 10 s over the lesion per sitting and patient had partial relief. We report this case due to its rarity and atypical clinical presentation which can easily be misdiagnosed. We seek to emphasize by this report that, in spite of its rarity, a diagnosis of anigokeratoma circumscriptum should be considered for any linear verrucous growth. 3. Kwon NH, Kim SY, Kim GM. A case of post-injury angiokeratoma circumscriptum of the chest. Ann Dermatol 2010;22:66-8. 4. Ghosh SK, Bandyopadhyay D, Ghoshal L, Haldar S. Angiokeratoma circumscriptum naeviforme: A case report of a rare disease. Dermatol Online J 2011;17:11. 5. Yaqoob N, Ahsan A, Ahmed Z, Husain A, Ahmed R, Kayani N, et al. Angiokeratoma of tongue: A series of 14 cases. J Pak Med Assoc 2006;56:285-7.